Members of Harvard’s graduate student unionization effort are for the first time reaching out to undergraduate teaching and research assistants to gauge their interest in joining a potential student union. Their efforts follow a decision by the National Labor Relations Board last month requiring private universities to consider graduate and undergraduate teaching and research assistants as workers. While graduate students across the country have mobilized to form unions, the ruling opened the door for undergraduate unionization. Dudley House is the main building for the Graduate School of Arts and Scieces. 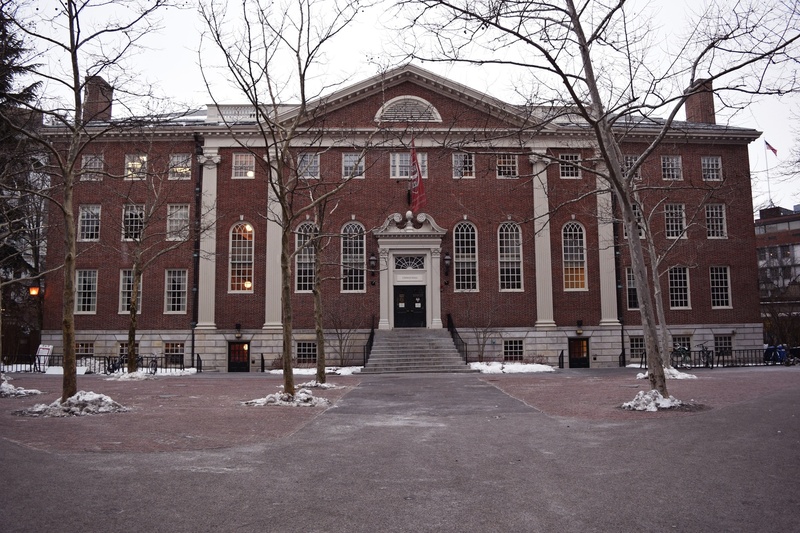 Graduate students involved in the campaign to unionize, called the Harvard Graduate Students Union-United Auto Workers, have taken to undergraduate dining halls to inform students about unionization and get them involved. Kieren S. Kresevic ’19 said he was approached in Adams dining hall and asked if he works as a course assistant. “The NLRB decision applies to both undergraduate and graduate students, and undergraduates are joining us to determine whether unionization is right for them as well,” Jack M. Nicoludis, a spokesperson for the graduate student union effort, wrote in an email. The movement to unionize, which The Crimson first reported in 2015, has gained widespread support. Last February, the group announced that a majority of graduate student teaching fellows and research assistants had signed an authorization card in favor of unionization. In order to form a union, the students will need to hold an election, but they have not yet announced a date on which a vote would occur. Faculty of Arts and Sciences spokesperson Anna Cowenhoven wrote in an emailed statement that, at Harvard, it is still unclear “who would be in any bargaining unit.” She did not comment further on the potential for undergraduate unionization. In an interview Tuesday, University President Drew G. Faust said she opposes undergraduate unionization for the same reason she opposes graduate student unionization: Faust said she believes such efforts would disrupt the academic relationship between students and faculty. Henry M. Gomory ’17, a research assistant for two sociology professors, said he was aware of the graduate student unionization effort before their outreach efforts. After a graduate student he knew approached him, Gomory said he signed an authorization card. “The grad student union is trying to be as inclusive as possible, to try to allow the opportunity for anyone who wants to be part of the union to be part of it,” Gomory said, calling the new outreach effort “exploratory.” He added that undergraduate and graduate student union supporters are spreading the word by reaching out to eligible students they know personally. Several undergraduates said they received emails or were approached about unionization. Sparsh Sah ’19, a teaching assistant for Economics 1010a: “Intermediate Microeconomics” and an inactive Crimson editor, wrote in an email that he was contacted with a request for an in-person conversation, and Filip Bujaroski ’18, a CS50 teaching fellow, wrote that he was also emailed. Cs50 course assistant Athena Kan ’19 wrote that she was both approached and emailed. Several undergraduate TFs, TAs, and CAs told The Crimson last week that they do not know enough about unionization to comment, or expressed apathy about joining the union effort because of their own satisfactory working conditions. But Gomory, who said he has good working conditions and very accommodating professors, said the issue extends beyond an individual worker. —Andrew M. Duehren and Daphne C. Thompson contributed to the reporting of this story. —Staff writer Leah S. Yared can be reached at leah.yared@thecrimson.com. Follow her on Twitter @Leah_Yared.